A young boy embarks on a quest to save his village. Kubo and the Two Strings is a masterpiece, and one of the very best films of the decade so far. This is a deeply immersive experience, and that level of engagement goes beyond groundbreaking visuals. It seemed possible at first, and now it's for certain: Laika has surpassed Pixar as the most promising and intriguing animation studio working today. Some would argue that Disney has lately been ahead of the game, though the House of Mouse hasn't had a film to match any of the Pixar masterpieces since Beauty and the Beast (over 20 years ago), regardless of how they compare with Pixar's current output. With Aardman relegated to only a film every three years, Ghibli on an indefinite hiatus, and Pixar's sequel rush to last a few more years, Laika's latest stop-motion delight has firmly settled things. Kubo and the Two Strings stands on even ground with the studio's other masterpiece, Coraline, and surpasses ParaNorman and The Boxtrolls (both excellent as well). It's been over half-a-decade since there's been an animated film this good. It may be another half-decade until the world sees another to match. Or at least another two years, as lovers of cinema hungrily await what Laika brings next. 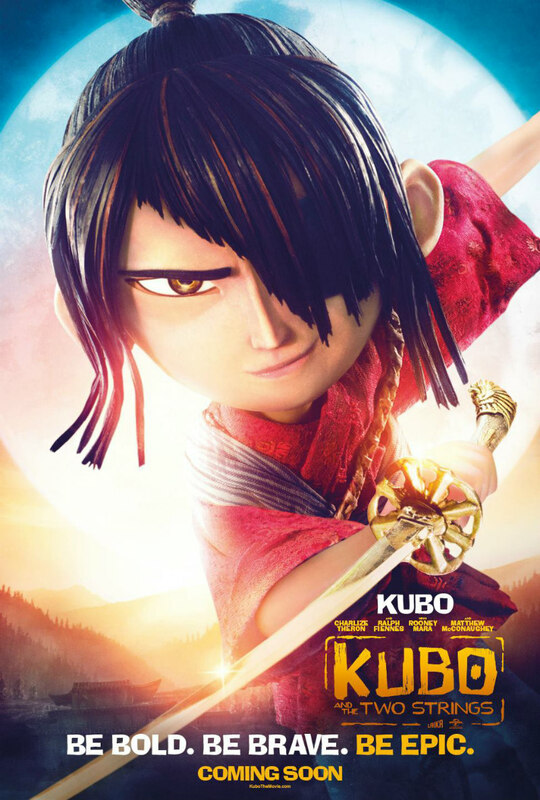 A young boy named Kubo is gifted with magical powers, inherited by his mother and deceased father. Using his shamisen, Kubo can control paper-light elements around him, which he uses to perform origami shows in the nearby village. But disaster befalls when he accidentally stays out after nightfall, prompting his wicked (and also magical) twin aunts to find him. In order to protect Kubo, his mother uses the last of her magic to send Kubo away and create a monkey guardian to protect him. Now far away from home, Kubo is to find three magical armor pieces to defeat his aunts and his powerful grandfather and save the village. 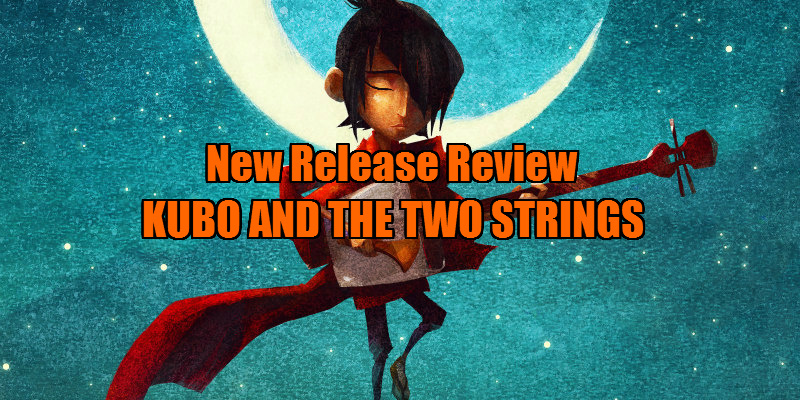 To detail everything that Kubo and the Two Strings does right would take more of a book than a review to discuss. Each and every scene is a present wrapped in the most exquisite stop-motion visuals ever committed to celluloid. The screenplay (written by Marc Haimes and Chris Butler, the latter responsible for ParaNorman's script) is one of deceptive depth, but also full of daring ideas. While lively, colourful, and action-packed, it may also prove challenging for children (and some adults!). Heartbreaking moments of mental limitations, death, and deep emptiness weave their way into the tapestry. Couple that with a fairly intricate plot (with some developments verging on abstract), and you have an animated work that puts more faith in its audience than most live-action ones. In every sense of the word, Kubo and the Two Strings is art; powerful and alive. It's often considered in bad taste to discuss the animation itself in a review because it is either seen as pretentious, or a sign that the film itself is not engaging. In this case, however, it's necessary. Laika has set an unfathomably high standard for their visuals, but this may be their most dazzling effort yet. On par with their strongest designs from Coraline (their peak in terms of the actual "look" of the film), but easily their greatest technical achievement, all the animators involved ought to walk away with raises or awards of some kind (but given the bafflingly poor US box-office performance of the film so far, it seems the former is highly unlikely). Genuinely stunning landscapes and environments make up every scene, and are often cut away from and never seen again as another even more beautiful scene reveals itself. Incredible detail fills every nook and cranny, sometimes making one long for a pause button just so that each gorgeous frame can be savoured. The character designs are wonderful (the "Sisters" in particular are a triumph), and the various textures (while not as dramatically varied as the recently-released The Little Prince) create such a tangible environment, it's hard not to reach out and try to touch them. 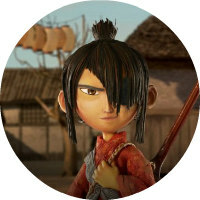 Reportedly, Kubo and the Two Strings took five years to make, and every second of care and attention given to it is clearly visible on the screen. The cast seems to relish the excellent script. Art Parkinson delivers one of those rare child performances where you forget that there's an actor behind the character (Laika has a knack for casting great child actors). Charlize Theron is cast as Monkey, which seems potentially silly, but Theron brings a lot of weight to this essential role. Matthew McConaughey is perfect as the dopey and heroic Beetle (though his tendency for silliness is perhaps the film's biggest, though barely consequential, flaw). Smaller roles are filled in by Rooney Mara, Ralph Fiennes and George Takei, and are no less superb than their leading castmates. Travis Knight (Laika's CEO, and an animator on all their films to date) makes his directorial debut here, and continues Laika's valued tradition of making films for people, rather than kids. This studio has never been one to prioritise commercial appeal (even The Boxtrolls, their most seemingly mass-appealing work, has its share of grungy ickiness), instead creating wondrous and imaginative works that alienate a few audiences in favour of enrapturing others. And as selfish as that may sound, it's all part of evolving this medium beyond the kiddie-fodder it's so often associated with. This level of risk-taking is hardly ever seen in Western animation not made by Pixar (and even then, only Inside Out really fits that bill among their recent efforts, at least, to the same extent as Laika). Kubo and the Two Strings may have its detractors (kids that find it too sad, adults that find it too odd), but surely its originality can be admired amid a sea of rehashy sequels and remakes. Very slight criticisms aside, Kubo and the Two Strings is a masterpiece, and one of the very best films of the decade so far. This is a deeply immersive experience, and that level of engagement goes beyond groundbreaking visuals. On an emotional level, Kubo and the Two Strings manages to transcend. Intermittent tears occur throughout the first half, but the ending may leave you in a sobbing puddle. Dario Marianelli's emotive score sparks the picture, the script dares you to believe in movie magic again, all the while, achingly lovely visuals - that may illicit tears from their beauty alone - envelope it all. "If you must blink, do it now," indeed. Kubo and the Two Strings is in cinemas September 9th.